You guys. I was so excited when I saw that I was getting an e.l.f. VoxBox. 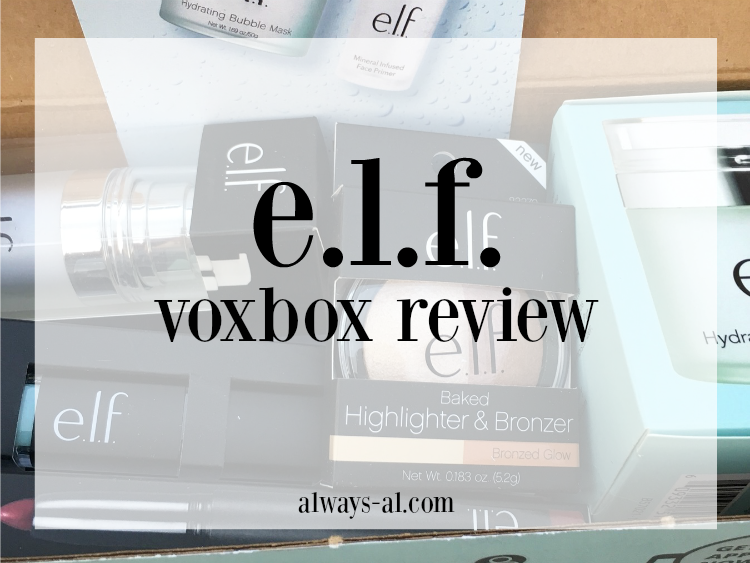 I've used and loved a bunch of different e.l.f. products in the past, including the Moisturizing Lipstick, and the Baked Eyeshadow Trio. e.l.f. also just came out with a new bubble mask, which is really cool. I have been wanting to try out a bubble mask, so I am very happy that Influenster sent one! e.l.f. Mineral Infused Primer - I'm fairly certain that I've tried this primer before, but e.l.f. possibly reformulated it. I don't remember liking it as much as I do. This is one of those products, however, that is better in moderation. I find that if I use just a little bit, it keeps my makeup on all day long. If I use too much, my face feels gross and slimy. e.l.f. Lip Exfoliator - I received this product in the mint flavor. Whoever thought of that is a genius. I love that this comes in a stick form, so you don't have to get your fingers all gross putting it on. I like to put this on while I am doing my hair, and I find that that amount of time is perfect to get smooth, conditioned lips. e.l.f. Matte Lip Color - This came to me in the shade Wine, and I absolutely love it. The applicator is great and perfect for getting an accurate line on your upper lip (which I sometimes struggle with). I wish this lasted a little longer on the lips, but it is certainly easy enough to re-apply! e.l.f. Cosmetics Baked Highlighter & Bronzer - This is an odd product in my opinion because the highlighter and bronzer are baked into one product mold. It is pretty hard to use them separately with a bronzer brush. I actually mixed the two together and used that for a highlight which was pretty. e.l.f. Hydrating Bubble Mask - I've never used a bubble mask before, and let me tell you... they are weird. I like that the packaging only dispenses a little bit of product at a time so that none is wasted. The gel is cooling and then bubbles up on your face. I didn't notice a huge difference in my skin tone or texture, and didn't really prefer the "carbonation" feeling on my skin. Does anyone have any recommendations? Am I using it wrong? *I received e.l.f. products free for review, but opinions are 100% my own.